Authors will discuss the burgeoning literary genre of creative non-fiction at a City panel event. The discussion, entitled Is Non-Fiction the New Fiction?, is being held with The Arts Foundation to celebrate the announcement of the shortlist for its annual awards programme. The event will take place on Thursday 19th January, from 6.30pm. It is free to attend and open to the public. 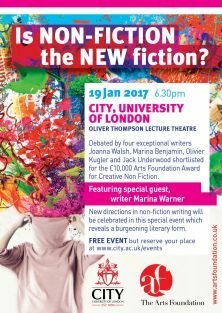 Candidates in the Creative Non-Fiction category of the awards will make up the panel, along with City creative writing lecturer Dr Julie Wheelwright and internationally renowned novelist, and cultural historian Marina Warner. 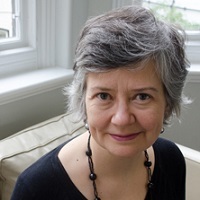 Dr Wheelwright, Programme Director of the Creative Writing (Non-Fiction) MA at City, is on the judging panel for the Creative Non-Fiction award. She said: “We’re delighted to be hosting this event with The Arts Foundation for an award that recognises the growing importance of creative non-fiction. The candidates were of an exceptionally high quality, reflecting the diversity of topics and originality of form that this genre offers." During the discussion, the shortlisted authors will talk about why they have chosen to write within creative non-fiction, an increasingly popular form of literary work that often brings together seemly disparate forms, such as poetry, philosophy, travel writing, memoir and reportage. Using narrative techniques often identified exclusively with fiction, the writers will explore through their own writing how and why this hybrid genre offers them the freedom to express their ideas and experiences that might previously have been limited to dramatic forms. Winners in all six categories of The Arts Foundation awards will receive £10,000, while runners up will receive £1,000. The Centre for English at City offers a range of Masters courses in creative writing, including programmes dedicated to non-fiction, literary novels, crime thriller novels and playwriting and screenwriting.